Built In the Heartland Of America FOR FISHING. FOR FAMILIES. FOR LIFE. Generations of boat builders and craftsmen in the aluminum boat-building capital of the world have taken their skills to new levels. Here they make America’s best selling fishing boats—and the current line-up is the highest-quality group of boats they’ve ever built. Each year, thousands of TRACKER owners give us feedback through our Voice of the Customer system, continually inspiring us to build better boats. This assures you that your new TRACKER is the finest boat it can be. The CSI Award is the leading measurement of customer satisfaction in the boating industry. It’s a tribute to our skilled craftspeople and the thousands of people in our company and dealer network who provide support to our customers. And, it’s confirmation that we continue to uphold the promise we made decades ago to deliver quality and value to our customers—a promise that has helped make us one of America’s favorite boat brands. 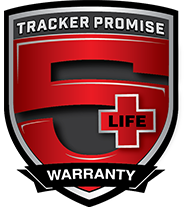 TRACKER uses world-class manufacturing methods, materials and components to deliver top-level quality. And we stand behind our boats with the strongest warranty coverage you can find. TRACKER Mod V, Deep V, and GRIZZLY hulls are all welded—hull seams, bulkheads, stringer, transom and gunnels are joined to form one unitized system stronger than the individual parts. And they are backed by our limited lifetime warranty. TRACKER is the only aluminum fishing boat manufacturer using robotic welding for stringers and transoms. This produces consistent high-quality welds and better fitting systems which make our hulls stronger, last longer and perform better than those built with traditional methods. The laser-beam-like accuracy of a plasma cutter is accurate to 1000th of an inch—about the same width as a human hair. That means that during welding virtually nothing is wasted, and all components fit together perfectly. TRACKER Diamond Coat™ is a multi-layer powder-coat finish that is three times harder, up to four times thicker and keeps its color up to 20 times longer than traditional liquid paint. Diamond Coat™ is the most durable, long lasting and environmentally friendly finish being used on any aluminum boat today. 2-part, expanding foam is injected into hull cavities to deaden the sound, increase the structural stability of the unitized hull/stringer/transom system, and helps absorb the shock of choppy water, increasing hull durability. The Mod V REVOLUTION HULL, found on our Pro Team models, features a variable deadrise for a smooth, dry ride and excellent handling. The 10° angle at the transom adds stability, and the sharper 20° angle at the bow slices through the chop. The POWER-TRAC™ set-back transom delivers undisturbed water to the prop for better performance. You will get the smoothest ride of any aluminum Mod V boat, or you can return it within 30 days for a full credit towards any TRACKER boat of equal or greater value. Turned down edges where the hull sides meet the bottom are reverse chines. These bite into the water for better steering response in turns. Water is directed down for a drier ride. Hulls and their support systems have to be strong, resist corrosion and last for years, extending into decades. TRACKER hulls and interior structures are made from the toughest boat aluminum of all: 5052 H34 Marine-Grade Alloy with magnesium for corrosion resistance. It is heat tempered for strength and maximum durability, and is used in many military applications. Boat decks have to absorb heat, vibrations and sound, retain fasteners, remain firm underfoot and last for the lifetime of the boat. We use ¾-inch 7-ply marine grade plywood, covered by our limited lifetime structural and deck guarantee, because it fulfills these requirements better than aluminum. Lean Thinking WHAT DOES SIGMA MEAN TO YOU? At TRACKER, we apply detail-oriented Lean Sigma principles to every step of the manufacturing process—this means identifying defects, eliminating waste, minimizing over-production and extra-processing, and utilizing everyone’s talents to the fullest. This allows us to push the limits of technology and creativity, producing better and better boats every year—making us the clear leader in the aluminum boat industry.